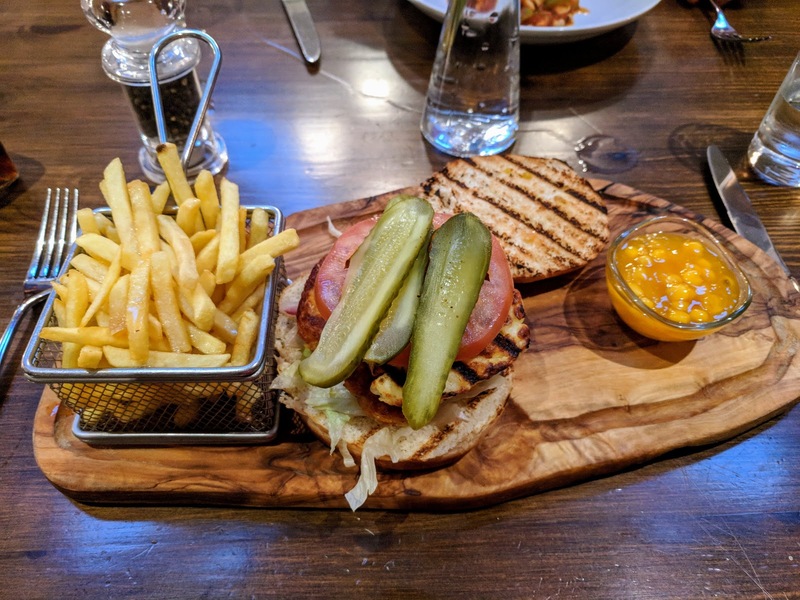 "Why visit Aberdeen"? That's the question my husband asked when I suggested that we spend a weekend in Aberdeen Scotland. Why not visit Aberdeen? Every place is worth visiting at least once and I find that some unlikely places simply capture my imagination. Aberdeen is one of those places (Tasmania is another). We had the opportunity to visit Aberdeen from Dublin for 2 days en route to the Edinburgh Fringe Festival. 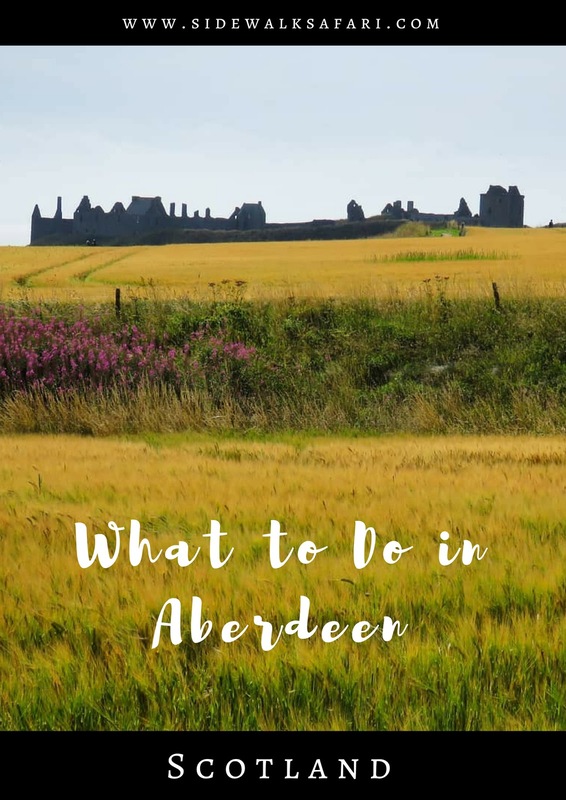 Read on for ideas of what to do in Aberdeen Scotland should you find yourself in a position where you need to answer the "why visit" question. In the summer, Aberdeen is a great small city to simply walk around. 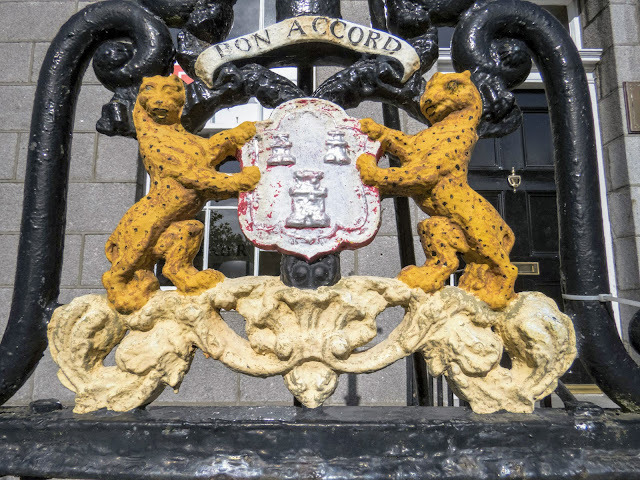 I like observing the small details in a place: like this crest featuring the motto, Bon Accord. Meaning good agreement, Aberdeen's city motto dates back to the 14th century Wars of Scottish Independence. 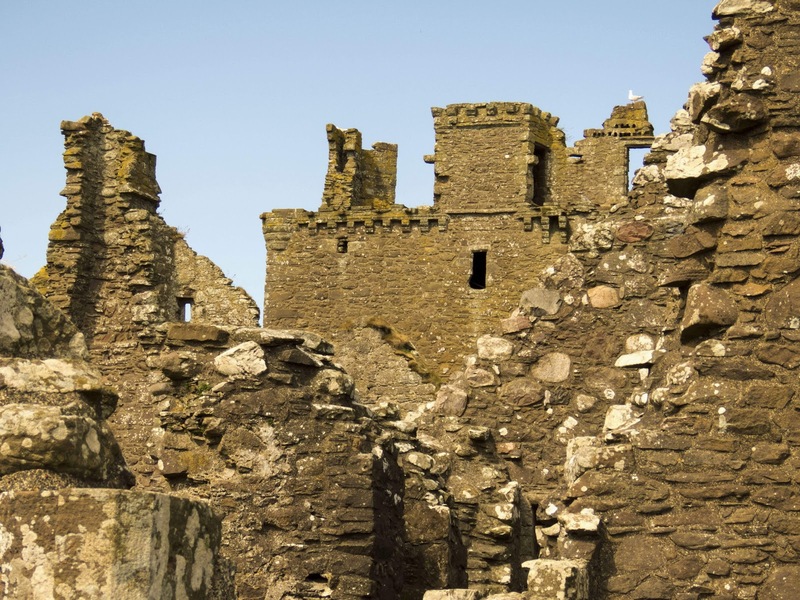 Legend suggests that the motto was used as a password at the time when Robert the Bruce laid siege on Aberdeen Castle and retook Aberdeen for the people. Bon Accord is now officially part of the crest of Aberdeen City. 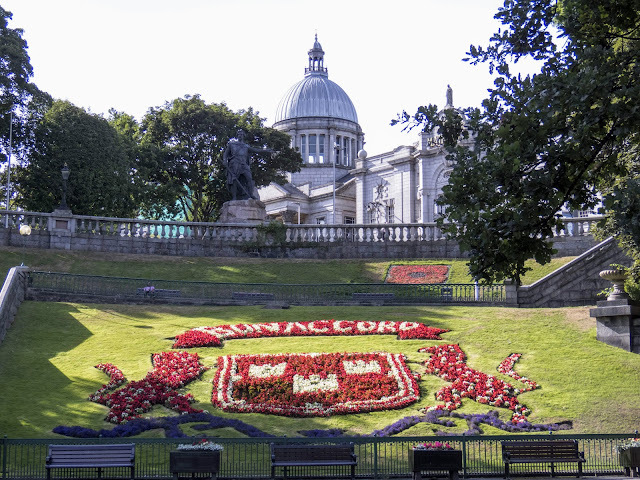 One fun thing to do in Aberdeen is visit Union Terrace Gardens. Sunken alongside a train track in the heart of the city, Union Terrace Gardens features Bon Accord emblazoned in the flower beds. Look up and observe the stately buildings all around you from a quiet vantage point below the hustle and bustle of the city. Aberdeen's Union Terrace Gardens also features plenty of innovative and edgy street art tucked away under a series of arches in the park. 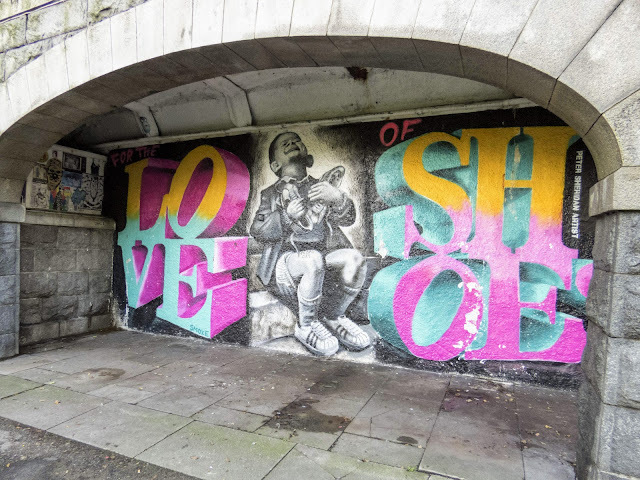 Take some time to explore Aberdeen's street art scene in microcosm here. Not far from Union Terrace Garden, St. Nicholas Cemetery in Aberdeen is another quiet spot to escape the buzz of the city. Graves rest in a park-like setting with a large and imposing church anchoring the grounds. Aberdeen Scotland is known as the Granite City. Simply take a walk around the heart of the city and you can immediately see why. Grey stone abounds everywhere you turn. The points and flourishes of buildings like Marischal College add a sense of drama to the architecture. We were drawn to one end of Castle Street in Aberdeen where an asymmetric tower captured my imagination. Benches surround Mercat Cross which marks the site of historic markets in Scottish cities. We found that Aberdeen's Mercat Cross was a great spot for people watching. Some locals playfully tried to jump into my photos as I tried to capture the magic of the scene around me. Aberdeen is a port city situated on the North Sea and maritime history is important to the city. The Aberdeen Maritime Museum features artifacts from shipping, transport, and petroleum industries from the distant past through to the present day. A historic figurehead from a sunken vessel carried me back in time. The museum also featured modern equipment for undersea exploration and you could practice driving a small, unmanned submersible device. The Aberdeen Maritime Museum is situated across three historic buildings in the city. 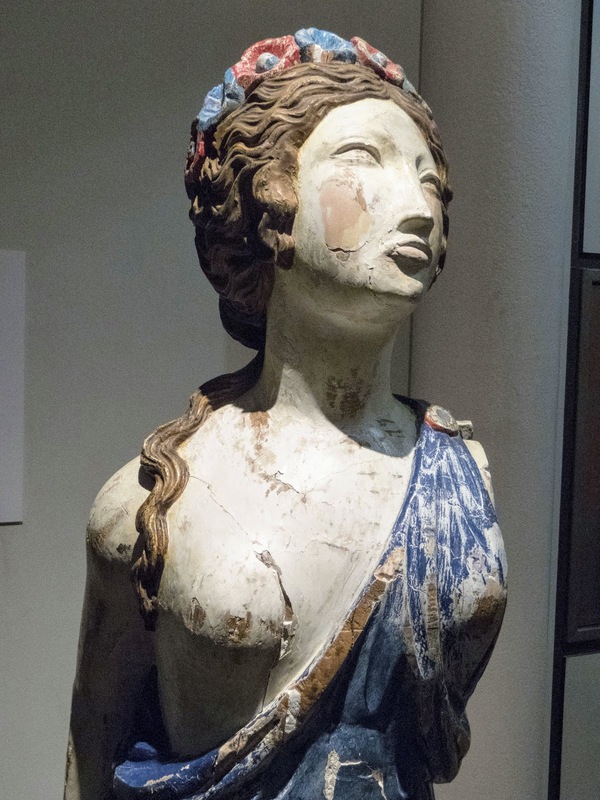 One wing of the museum is more focused on art. Paintings and photographs line the walls of a classic Scottish mansion. One exhibit shared stories of Aberdeen residents who worked on offshore oil rigs in the North Sea and covered both the happy memories and camaraderie as well as the dark and dangerous side to the work. The Aberdeen Maritime Museum is at the top of my list for things to do in the Granite City. The Aberdeen Maritime Museum is also a great choice if you are looking for something to do in Aberdeen in the rain. 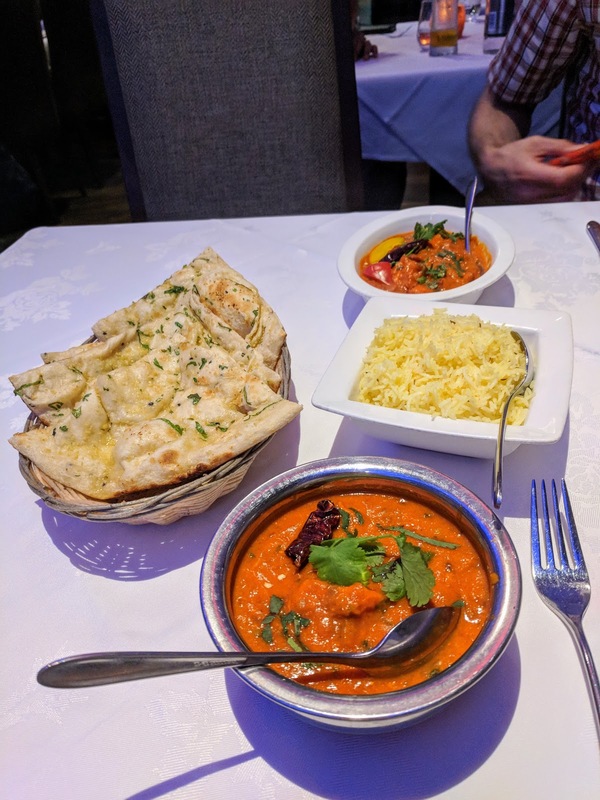 We ate really well on our trip to Aberdeen. Dine on hearty burgers and chips at Howie's. We drank water but just as easily could have washed down our meal with an elegant gin and tonic. 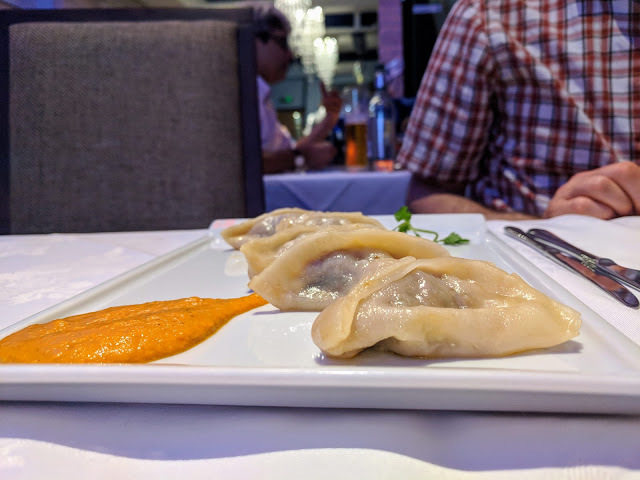 8848 Restaurant (named after the height of Mount Everest) is a popular spot for Indian and Nepalese cuisine in Aberdeen. We enjoyed momos and comforting curries for dinner at 8848. One of my favorite things to do in Aberdeen is to imbibe their most excellent Scottish craft beer. Visit Triple Kirks near Union Terrace Gardens for a variety of Scottish and international craft beers on tap or in cans. From Mercat Cross, we could see that quintessential of Scottish craft beer pubs: Brew Dog. We were headed in that direction when we spotted another craft beer pub just behind it called Fierce. 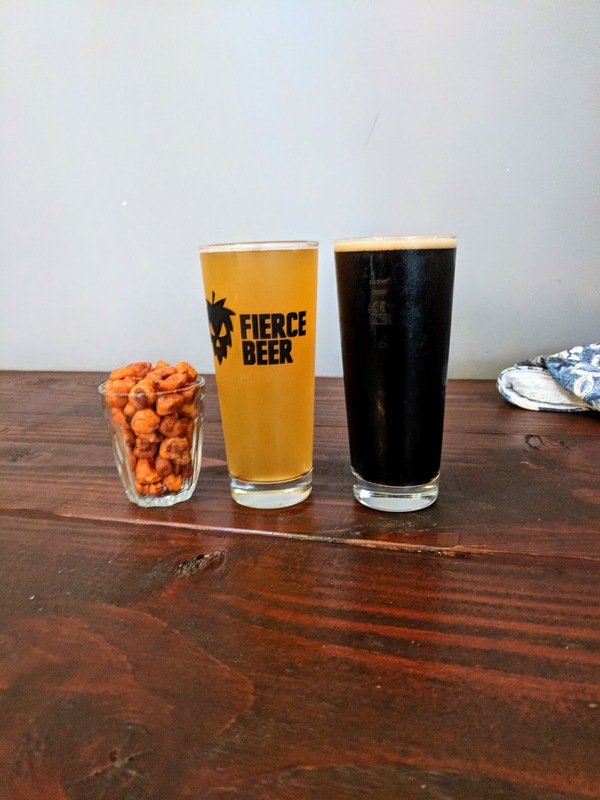 Brew Dog is pretty widely available (we drank our fair share in Edinburgh, for example), so we decided to give Fierce Beer a try. We tried PBJ Riot, a stout which was deceptively refreshing, effervescent, and sour. I loved Fierce Beer's unconventional brews. CASC is another great option for sampling a variety of Scottish craft beers. 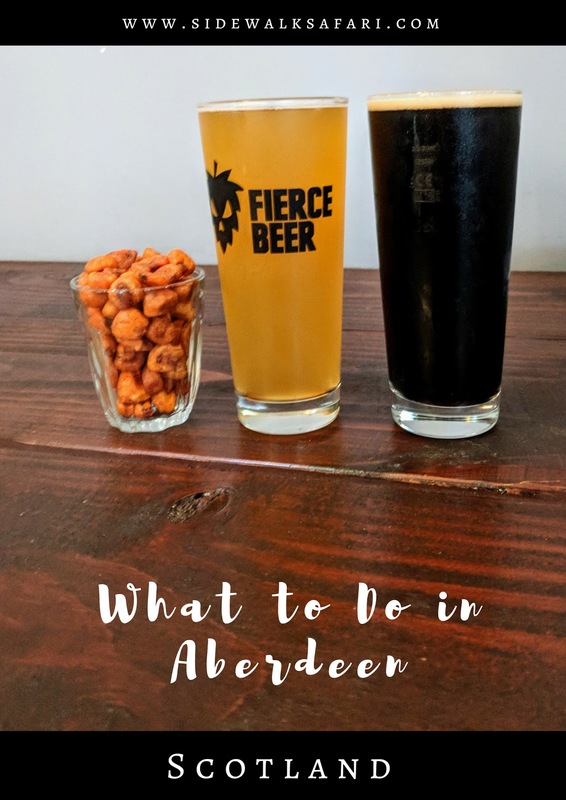 I hope you'll agree, there is no shortage of great places to drink craft beer in Aberdeen. 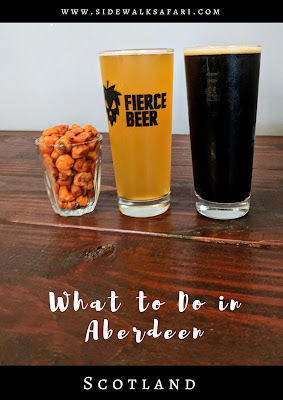 The beer was definitely one of the highlights of our weekend city break and Aberdeen City is probably worth visiting for the pubs alone. Dunnottar Castle ruins cling to a cliff about an hour and fifteen minutes outside of Aberdeen. Accessible on the X7 public bus (9.50 GBP at the time of writing for a Zone 3 Grasshopper Day Ticket, pay on the bus), Dunnottar Castle is an easy and impressive day trip from Aberdeen. 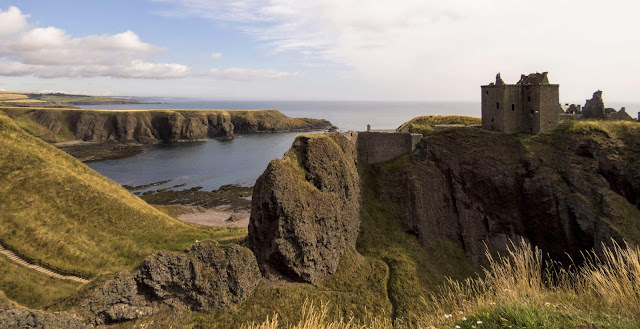 Dunnottar Castle is an intimidating Medieval fortress most famous for the role it played in hiding the Scottish crown jewels from Oliver Cromwell's invading army. 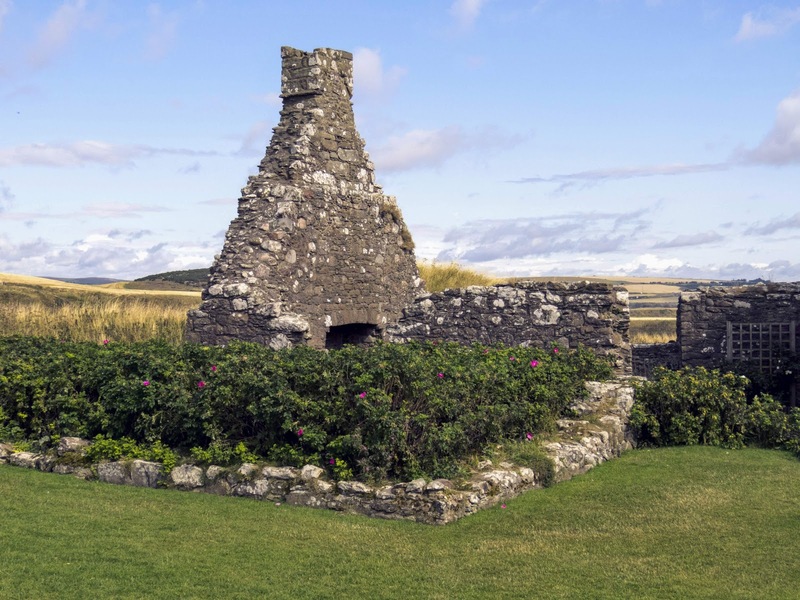 Walk among the ruins that date back to the 15th and 16th century and imagine what life must have been life on this windy outcrop. 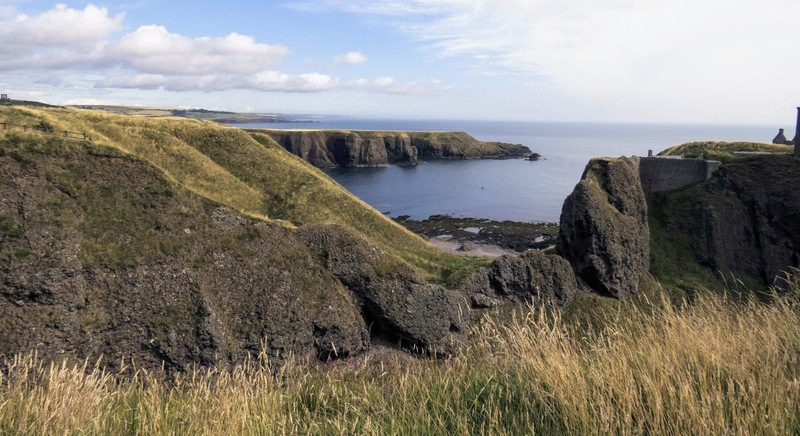 Dunnottar Castle to Stonehaven Scotland is about a 45 minute walk along a cliff side path by the sea. Have your camera ready to capture the stunning views over the North Sea. There is one very important thing that you must do when visiting Aberdeen in general and Stonehaven more specifically: eat a deep-fried Mars bar. The deep-fried Mars bar is available all over Scotland but it was invented at Carron Fish Bar in Stonehaven. We couldn't resist indulging in this Scottish delicacy. Deep-fried Mars bars are made by deep freezing the chocolate and then dipping it in the same batter used to make fish and chips before dropping it into the fryer. The result is a savory sweet combination that simply melts in your mouth. I could feel my arteries clogging with each bite but it was so worth it. We ate our fried Mars bar along the beach in Stonehaven. You can't beat the setting! Speaking of Stonehaven Beach, make time to take a walk along the water. Various scrap metal sculptures in the shape of ships, lighthouses, and other nautical motifs line the coastal path. The easiest way to get to Aberdeen is to fly. Aer Lingus offers nonstop service to Aberdeen from Dublin at least once a day. 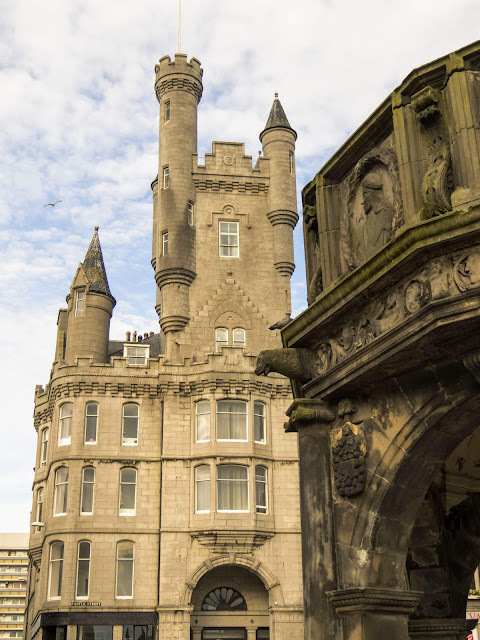 Aberdeen is also easily accessible from London and other cities in the UK. Aberdeen is well-connected by train to Edinburgh and the train journey from Aberdeen to Edinburgh takes about two and a half hours. 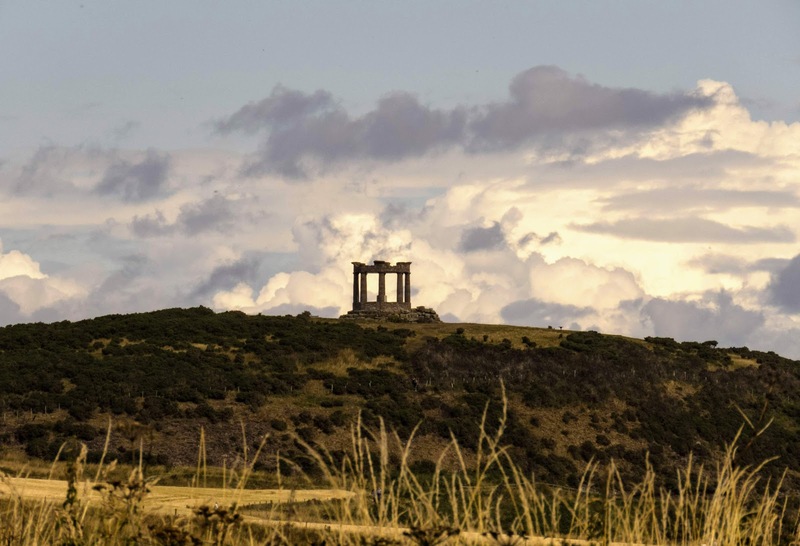 We flew in and took the train out to carry on with our trip to Scotland in Edinburgh where you'll find plenty of additional things to do like visit the Royal Botanic Garden Edinburgh, take a walk on the Water of Leith, and enjoy countless performances at the Edinburgh Fringe Festival. Check out this handy Aberdeen map to orient yourself to the various things to do in the Granite City. 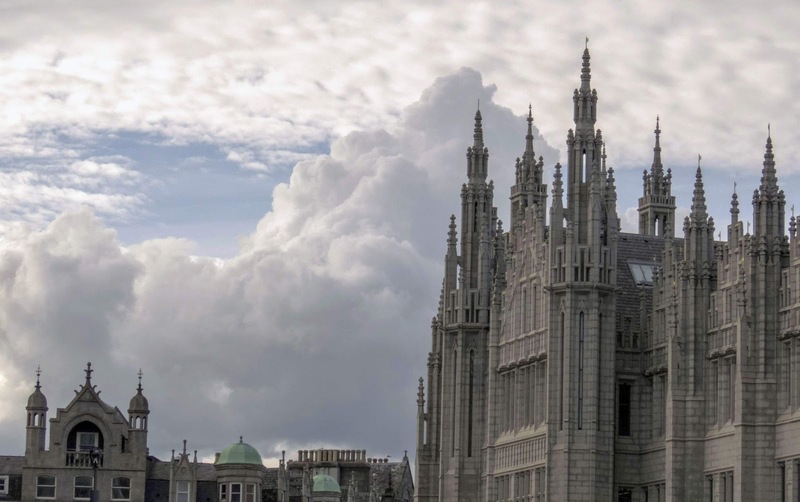 Why visit Aberdeen Scotland? 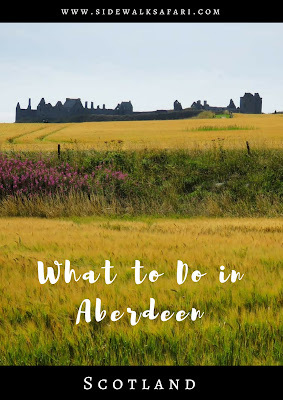 Read about things to do in Aberdeen UK including the Aberdeen Maritime Museum and a day trip to Dunnottar Castle. Find out what to eat in Aberdeen including fried Mars bars.